Victor McLaglen. EXPRESS TO HOLLYWOOD. Jarrolds, London, 1934. This is a return visit to a resolutely unfindable book. Actually, Peter M a reader of these postings found a copy and mailed me these images. Many thanks. There are no copies on the web and I have only heard of one going through Ebay; there is also the copy mentioned by Prize Fighter in the old comments field. 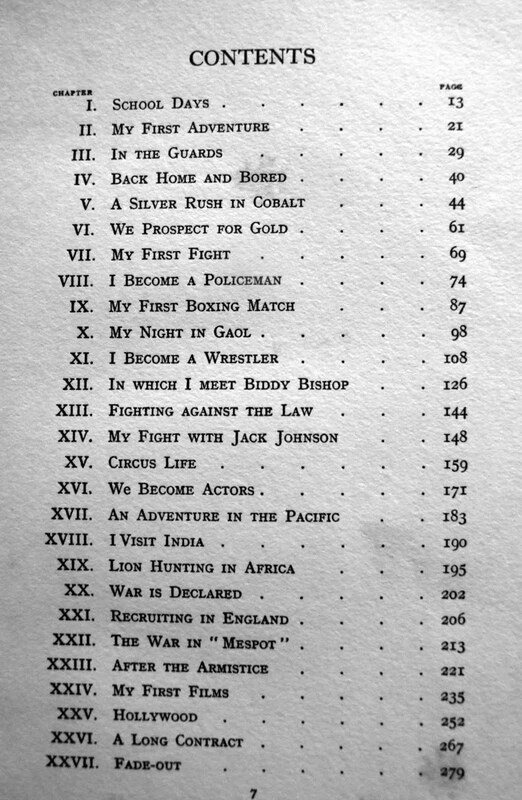 Family members, boxing fans, Brits in Hollywood scholars and movie fans want it. "His tale of the road, his odyssey from his native England through Canada and the western United States, details his long-held desire to be a professional prizefighter, climaxing in a no-decision fight with world heavyweight champion Jack Johnson. 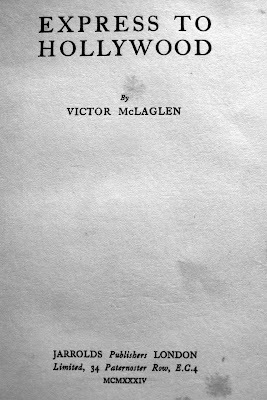 McLaglen supplements his story with vignettes of life as a farmer, gold and silver prospector, wrestler, policeman, soldier, vaudeville performer, miner, pearl fisher, big-game hunter, and sign-painter. 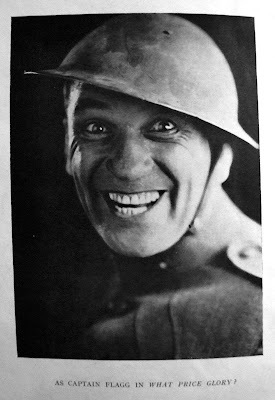 In all likelihood the only Academy Award-winning actor ever, past or future, also to be Assistant Provost Marshal of the city of Baghdad, McLaglen writes a story that reads as though Jack London had written it. He writes with candor and humility, and with style. It is am immensely enjoyable book, and the fact that McLaglen was at the time of its writing only beginning to achieve the fame and popularity that would maintain his career nearly another three decades is both astonishing and a bit disappointing: it would have been wonderful to read his accounts of the next quarter century...."
Of course he went on to make "The Informer," "The Quiet Man," and "What Price Glory?". I have trod on his name on Hollywood Boulevard where, as Ray Davies has it, his name "is written in concrete." VALUE? 20 years ago someone paid $120 for a signed photo at Darvick , there was a BIN for an insubstantial clipped note at ebay for $250. Sanders Autograph Guide (2000) rate his signature at $165 and a signed photo at $335 and spell his name McLaglin. He wasn't John Wayne, who can go very high indeed, but for some reason hard guy's signatures are often pricy. Jarrolds, an East Anglian publisher, tended to have funky colourful jackets so it would look good and modestly priced in the low to mid hundreds it would probably sell to the fastest finger in less than an hour on ABE--there are over 40 buyers waiting. It is a boxing book which, as far as I am aware is still a lively collecting area; there are even boxing book specialists - I used to ask them in vain for Arthur Cravan posters. Do they join the ring? Sans jacket the book still very good, people want to read it. There are no Kessinger reprints. Ugly though they usually are, new printings would lower the price. 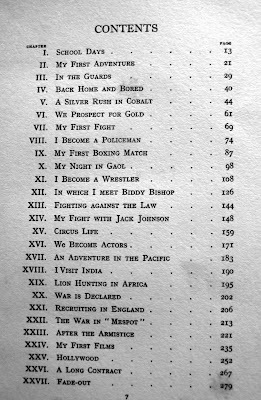 George MacDonald Fraser is very good on VM in The Hollywood History of the World; he was an Irish Guards officer, may have been one of the best British boxers ever, and was ruler of Baghdad for a while. GMF points out that Wee Willie Winkie may be one of the worst films ever made, but preserves for ever - thanks to VM - the authentic accent of the old British redaoat army.